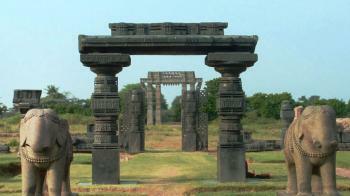 Warangal was the capital of Kakatiya Dynasty who rules there from 12 to 14 century. The construction of the fort was started in the 1199 AD during Ganapathi Deva and finished in 1261 AD, in the period of Rani Rudramadevi daughter of Ganapathi Deva. Some modification were done between 15 to 17 centuries consisiting of the creation of the gates on the outer earthens wall and the addition of the barbicans to the four gates in the stone wall. Between October to March is the best season to visit the park. By Air - Hyderabad International Airport is the nearest airport to Warangal Fort and is about 150 km away. By Rail - The nearest railway station to the fort is Warangal Railway Station.